Get-Office365AzureFirewallApplicationRule -serviceArea Exchange -ruleName "net-azfw-rul-application-allow-http-ExchangeOnline"
Get-Office365AzureFirewallApplicationRule -serviceArea SharePoint -ruleName "net-azfw-rul-application-allow-http-SharePointOnline"
Now that you have generated the desired rules, you can simply copy/paste those in your Azure Firewall ARM template/parameter file under the applicationRuleCollections property. In the example above, the variable named net-azfw-rul-basic-application-rules are the rules that will be present in all deployments while the parameter named net-azfw-rul-custom-application-rules is for the rules that are specific to a particular deployment in an environment/region. Should you have questions or comments regarding this post, feel free to leave a comment below! While troubleshooting a particular DNAT rule implemented with Azure Firewall, we noticed the outside traffic was not reaching the targeted VM as intended. Note that my internal IP is excluded so that I can see only the traffic coming from outside Azure for a particular DNATed port. By using this, we were able to determine the source IP seen was from the AzureFirewall subnet but not exactly the internal IP being shown in the portal. That is mostly likely due to the HA/load balanced setup for Azure Firewall requiring multiple instances to operate. Once we added the appropriate address to the NSG rule, the traffic was flowing properly to the VM and the NSG was re-tighten for the pleasure of our security folks! I’ve hit a particular limit that was not clearly documented in the link above. In one deployment I was working on, I was at the limit of backend address pools, listeners and rules but for some reason, the deployment seemed like it was never-ending and the App Gateway instance ended up being in a failed provisioning state after the resource was in a deploying or updating state. After discussing with support, we found out an internal part of Azure called the infrastructure agent couldn’t handle the size of the configuration file to be deployed (limited at 128KB per setting), which in turn causes the Azure Network Regional Manager’s operation to timeout. When that happens, the Application Gateway deployment will appear as it never ends but will eventually fail and the instance will end up in a failed provisioning state as mentioned earlier. In my case, the ARM template parameter file alone had over 395KB but that size is not exactly representative of the issue. The particular issue in my case seem to be related to the size of the requestRoutingRules setting, which was sitting around 220KB by itself. What I did at this point in time to lower the size of the ARM template configuration was to combine the backend address pools containing the same servers into one address pools instead of having one per web application hosted behind Application Gateway. The original idea for this was to be able to modify the backend address pool of an application to add/remove servers as needed without touching other applications. While combining backend address pools moves away from that principle, it does have the advantage of simplifying things a bit configuration wise, which in turns reduces the size of the configuration file passed to Azure. By applying this change and updating all the request routing rules, I was able to reduce the template parameter file from ~395KB to 340KB but of particular interest, was the requestRoutingRules section which was now down under the 128KB mark at ~120KB, simply by shortening the name of the backend address pools specified in the rule. With that rationalization applied to the ARM template parameter file, the deployment went through successfully. With that limit in mind, all the little things matter such as keeping name concise as that will help keep the size under the limit. I’m still in touch with Microsoft Support to make sure that information makes it to the service limit documentation. When working on identifying flows that should be allowed by your Network Security Groups in Azure, a great tool you can leverage is Azure Traffic Analytics data stored in Log Analytics. 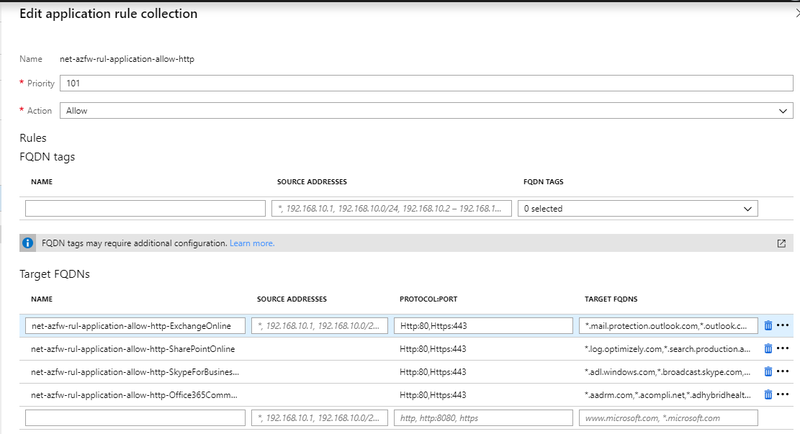 In supported regions, you can send NSG flow logs into Azure Log Analytics where you can run queries to help you identify legitimate flows you might be blocking in your network. If you remove the resource tags portion, you can see it’s pretty straightforward to enable Network Watcher! I’ve tried to enable Flow Logging and Traffic Analytics directly via Azure Resource Manager but initially but it didn’t work. I’ve engaged with the Azure Networking folks who kindly explained that enabling flow logging and traffic analytics is done post-process, something that’s not supported by ARM template as that would make the template not idempotent anymore. $NWs = Get-AzurermNetworkWatcher -ResourceGroupName "rg-$environmentCode`-net-generic" -Name "net-watcher-$environmentCode`-$countryCode`-$regionCode$regionId"
You can verify that flow logging and Traffic Analytics is correctly enabled in the Azure Portal by going to the Flow Logs section in Network Watcher. It may take a little while before the flow logs start showing up in the specified Azure Log Analytics workspace but once it’s there, you can can issue a query like to following to help you identify at a high level which flow are getting blocked. In the screenshot above, a couple of computers required port 135 to communicate, which was blocked by a core/deny all NSG rule. You may discover some chatty computers that shouldn’t be communicating with each other due to misconfiguration or actual legitimate flows that should not be blocked and are probably causing issues in your environment. One thing that’s worth mentionning, I noticed in our environment that some of the flow records don’t always have the destination IP included (I’m talking with the Azure Networking folks about this as well). In that situation, I have to resort to look at the flow log files stored in Azure Storage to determine what’s actual the targeted IP being blocked. At the moment, I only noticed this for outbound flows. Source IPs of inbound flows seem to show up correctly. Should you have any questions about the blog post, feel free to ask questions via the comments section. When building Azure Resource Manager template, it’s often a challenge to keep your template generic enough so that it can be reused. A VNET ARM template which leverages subnet Network Security Groups (NSG) can be especially challenging on that side as you often need to specify IPs in your rules that are specific to a particular deployment. If you hardcode rules , you lose the reusability of your template which offsets a bit the benefit of having an ARM template. i.e. if you only need generic rules, don’t need to define subnet common rules and/or deployment specific subnet rules; keep it simple! Here’s an example of what that looks like in practice. As you can see below, the parameter named net-nsg-snet-edg-custom-rules includes a single NSG rule that will be passed to the ARM template. It includes sample IP addresses for source and destination. The naming conventions for the specific deployment is also built from parameters/variables. I didn’t include all the intricacies of this in order to simplify the ARM template example below. I recently had to create an ARM template to create VMs in Azure and wanted to dynamically create data disks. I first started by using a simple copy operation within the ARM template but that didn’t provide the flexibility I wanted. If you use the copy capability in ARM templates, all your data disk will have the same attributes (size/name, etc). It often happens when you’re building VMs like for SQL Server that you want to have disks of various sizes for different purposes, for instance a disk for each database. The loop above creates an array within an array to support multiple VMs with each multiple disks. When $allDataDisks is passed to the ARM template, it gets properly serialized as JSON so it can be used by ARM. One trick I learned while doing is was to use the “,” unary operator to properly create an array of arrays. If you simply use $allDataDisks+=$vmDataDisks it will will simply merge both arrays together, which is not what is needed to properly pass the data disks over to the ARM template. By using “+=,” it will properly add the $vmDataDisks array object to the $allDataDisks array. Note in the example above, there’s a reference to copyIndex as that particular ARM template can create multiple VMs with the same configuration. As each VM has its own set of disks, you can simply reference the proper VM by specifying the proper index of the array being passed to the template. More flexibility could be provided by adding/passing additional disk properties. If you need to create multiple disks of the same size, i.e. if you want to create a Storage Spaces Direct cluster, you would need to specify each disk. In the following post, I will try to explain the approach I’ve used to estimate the costs of running a few hundred VMs in Azure IaaS.As manually sizing each individual VMs would take quite some time, I preferred to go with an automated approach. At a high level, here are the steps I’ve taken to achieve this. 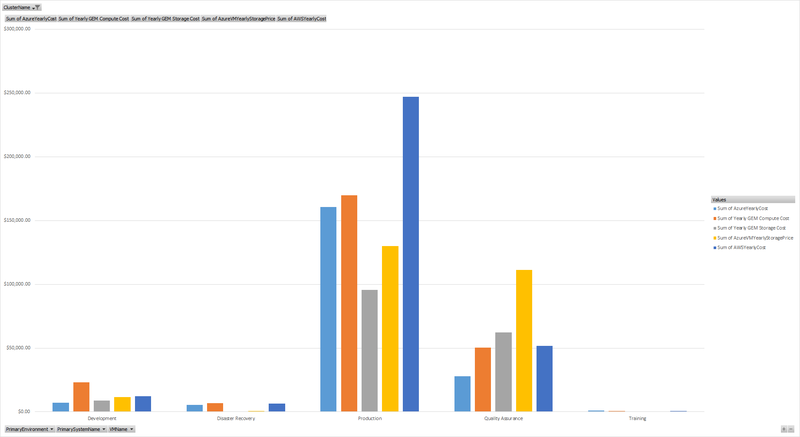 Based on that data, I’ve extracted pricing information for all the VM sizes in the particular region I was interested in. I took the CSV files and loaded them in a SQL Server table in the same database containing all my Hyper-V metering data. Here’s what the data looks like in the table to give you and idea. Now here comes the tricky bit of the process. At a high level, here’s how the Azure VM size logic works. Find a VM with enough vCPU to support the number of MHz the VM is currently consuming. This logic is crude at the moment as I’m strictly doing a conversion from MHz to number of cores independently of the actual CPU in Azure. I will work on tweaking this aspect in the future. Find a VM size with as much RAM as what’s being used on premises. Of all the options that are matching what’s needed, sort them in ascending order of price and pick the cheapest option. An important step in cost sizing and optimizing your workload in Azure involves determining the VM operating hours. i.e. Some VMs don’t always need to be running 24/7, so why pay for those extra hours? In my case, I applied the following general assumption in my logic. This can definitely be refined but it gives a good idea. Now that you have the operating hours in hand and the actual VM size, you can now determine if it’s better to pay hourly for it or if it’s better to get a reserved instance. If your VM is running 24/7 you definitely want to leverage the pricing of Azure Reserved Instances (RI). 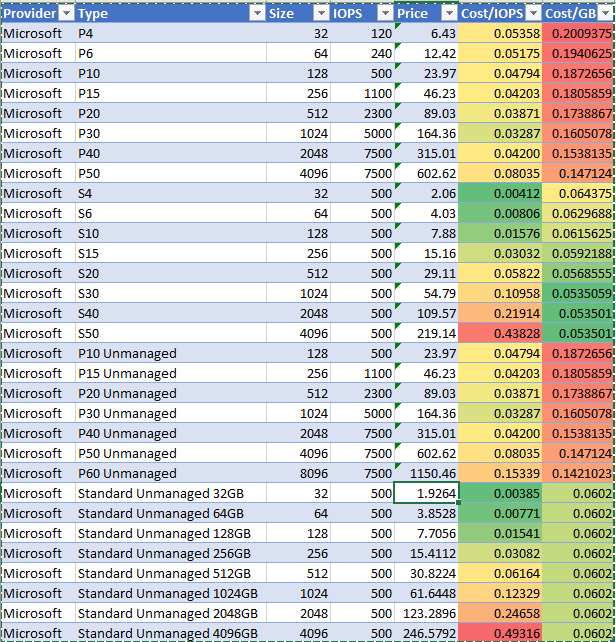 For the other cases, you have to evaluate if the operating hours of the VM vs the discount level you get with an Azure is worth it. Another fun part of sizing your VM is determining what type of disks you will use and how many of them are required to support your workload. As there’s a wide range of options, finding the most cost effective option can be tricky/time consuming. As you can see below, there are quite a few permutations you need to consider! Load the pricing of all the storage options in a table, managed/unmanaged, standard/premiumIn my case here’s what I ended up doing, it’s not perfect and still needs some work but it gives an idea! À la Apple, there’s one more thing I omitted to mention. In that exercise, I wanted to compare costs with AWS out of due dilligence. In order to achieve this, I went through the list of Azure VM sizes and manually found the closest size equivalent in Amazon EC2. So when I’m I’m picking the size of an Azure VM, I also pick an equivalent size at Amazon for that VM along with its pricing information. The same type of pricing logic is applied to keep things as fair as possible between the two options. Right now I have yet to tackle the VM storage sizing piece, that’s one of my next step. I’m also attempting to compare cost with our on-premises infrastructure but that involves a whole separate set of calculation that I will not cover in this version of the article. Just be aware that it’s feasible if you roll-up your sleeves a bit. In the end you can have a nice looking chart comparing On-Premises/Azure/AWS/etc.! Needless to say this is by no mean a perfect sizing methodology. It’s still very rough around the edges but should give pricing ballpark. The goal is to have an iterative approach in order to appropriately size your workload for execution in Azure. You may find that some workloads are just not good candidate at all depending on your requirements. There are a LOT of variables to consider when sizing a VM and not all of those variables were considered in the current iteration of the process I have so far. I’ll keep adding those to improve/optimize the costing model. I’d like to package this better so that I can share the sizer with the rest of the community. When things stabilize a bit with the sizer, I’ll definitely work on that. If you have questions/comments about this blog post, feel free to comment below!